Aside from cat videos, the greatest gift the internet gives us is knowledge. But how can you separate the genuine career boosters from just another book on your to-read pile? 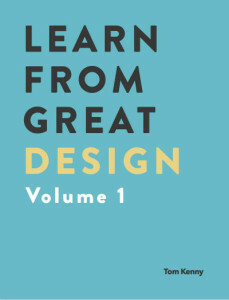 Below, we’ve listed out the 11 best free UX design books to check out as we enter the new year. UXPin explains the craft of UI and UX design through the science of human sight. 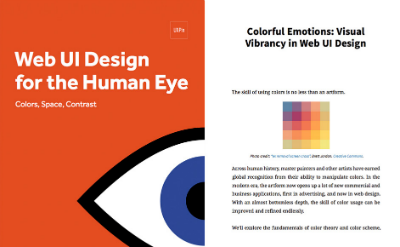 Any designer in a visual medium can benefit from knowing the basics, and the two-volume series Web UI Design for the Human Eye teaches them in an easy-to-understand way that relates to web design. Volume 1 discusses the emotional effects of different colors, influencing user sight flows, and applying the Gestalt principles that govern optical illusions. Volume 2 goes into further detail by explaining common sight behaviors, the F-pattern and the Z-pattern, typography, and overall layout organization. 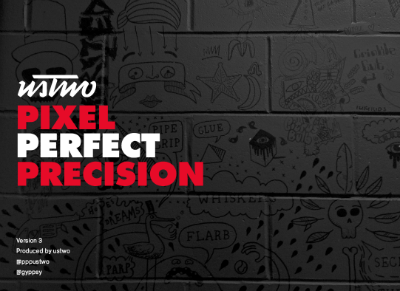 Regularly updated over the last four years, the third and latest version of the Pixel Perfect Precision Handbook brings updated content to a classic go-to manual for visuals in web design. This e-book gains its fans with its focus on visual design and includes how-to instructions for Photoshop. The new update features 40 new pages of content. 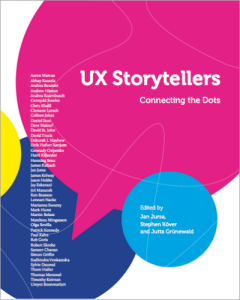 A true classic of UX design e-books, UX Storytellers remains relevant thanks to its unique structure: it’s not a how-to guide, but a collection of self-sufficient stories and tips from 42 actual UX experts. With 586 pages, you can pick up this book anywhere and anytime to learn something new, and it comes in handy when you need a fresh perspective. Looking back at the trends from 2015, this book analyzes what worked, why, and how to implement it going forward. 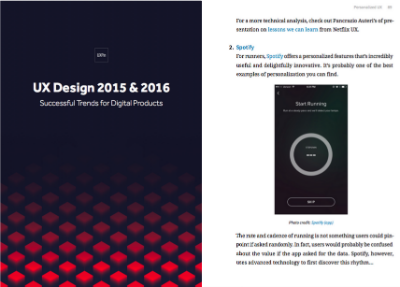 UX Design Trends 2015 & 2016 explores the 6 most successful UX trends at the moment and outlines the best practices for each, including case studies of popular sites like Waze, Spotify, Vine, Virgin America, and many more. Topics like personalization, micro-interactions, and multi-device experiences will only become more important with time. Love it or hate it, CSS now plays a big role in modern web design. Adam Schwartz’s The Magic of CSS dissects the language in simple, easy-to-follow guidelines, and shows example code and diagrams. The more technical and complicated areas even have templates and data reference charts. The book is available in its entirety online, so if you ever find yourself wondering about a specific aspect, no matter how small the answer is only a few clicks away. 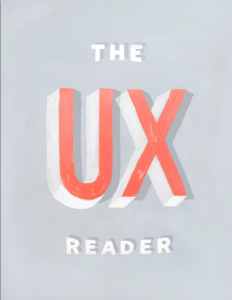 MailChimp’s The UX Reader covers the discipline of UX design from front to back. This all-inclusive guide is great for beginners starting from scratch but is also a handy reference guide for experts to keep on their digital shelves. This e-book lays out UX design into the five categories of Collaboration, Research, Design, Development, and Refinement. Each category is further divided into article-like sections written by different members of the MailChimp UX staff, so you can pick and choose the topics relevant to you. A classic in UX e-books, the seminal 50 User Experience Best Practices was so successful, it actually outlasted the UX design agency that wrote it. 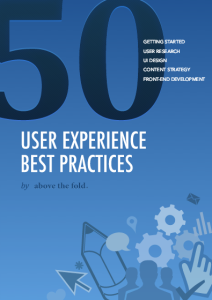 This e-book lists out 50 tips to improve your user experience across the board, spanning the fields of user research, process flow, content strategy, planning, and front-end development. With specific advice on a wide-range of topics, there’s something for everyone. The casual tone and memorable graphics certainly don’t hurt either. 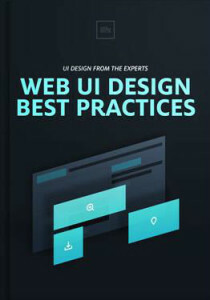 Web UI Design Best Practices is UXPin’s version of a cover-all guide. As with their other e-books, this one offers the same technical analysis explained through simple language that regular readers have come to expect. This e-book is broken up into sections on navigation, color, typography, UI patterns, and visual hierarchy. The benefit of this book is how it combines other disciplines of web design, namely interface and graphic design. UX design, in general, is an abstract field, and is never separated from the other components of web design. Tom Kenny runs the blog Inspect Element, which deconstructs a new sight every week and explains what they do well. Kenny goes through page by page, across different devices like desktop and mobile, and illustrates his points with multiple screenshots. While a fuller book is available for purchase, the free downloadable content, Learn from Great Design, collects three such case studies and cycles them periodically. This teaching strategy is quite effective, especially in a visual medium like web design. The comparison of sites across devices is invaluable for maintaining a consistent UX, and this detailed treatment simply isn’t offered by most free e-books. Another classic, Bright Ideas for User Experience Designers looks at the practice of UX design from the eyes of the UX experts at Userfocus. The best part about this e-book is its humor and laid-back tone, both of which contribute to its memorability. With fun acronyms like "the CRAP way to usability" and analogies involving the Beatles, this book is as entertaining as it is educational. 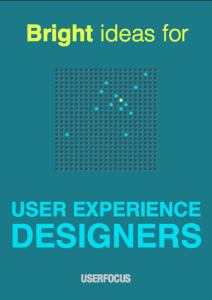 Userfocus offers a series of free UX e-books targeting different career paths. If this book seems helpful, check out the other "Bright Ideas for…" books aimed at either UX managers or UX researchers. 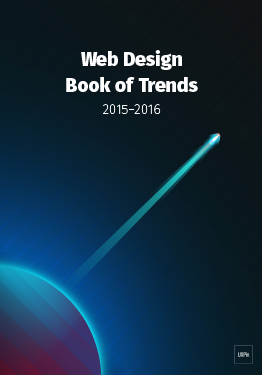 Last on our list is UXPin’s Web Design Book of Trends 2015-2016, one of their latest. The web design industry advances rapidly, keeping up with technological advances, the trends of user preferences, and simply discovering new best practices in a field that is still, relatively, young. The same techniques that were cutting-edge last year can make your product seem outdated this year. UXPin’s book keeps designers up-to-date. This volume covers the theory and best practices of trends like hero images, card layouts, long-scrolling, and HD visuals, drawing on examples from 166 popular sites like Apple, Dropbox, and Spotify, and featuring 100 additional online resources. Jerry Cao is a UX content strategist at UXPin â€“ the wireframing and prototyping app . His Interaction Design Best Practices: Volume 1 ebook contains visual case studies of IxD from top companies like Google, Yahoo, AirBnB, and 30 others.